Bryant Park Blog: Scott Adlerberg on "Chinatown"
Resident film expert Scott Adlerberg, who hosts the Reel Talks discussions, shares his thoughts on this week's HBO Bryant Park Summer Film Festival presented by Bank of America screening of Chinatown (1974). 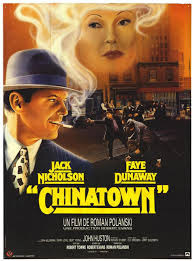 Roman Polanski’s Chinatown opened in 1974 to great reviews. It went on to do well at the box office and got 11 Academy Award nominations. Robert Towne’s now legendary script won the Oscar for Best Original Screenplay. It's a film in which Jack Nicholson and Faye Dunaway work at the top of their form, the production design by Richard Sylbert brings 1940’s era Los Angeles to life, and the score by Jerry Goldsmith augments the film’s mood perfectly. Everything clicks in Chinatown, and in the 41 years since it came out, its stature has never diminished. Polanski and producer Robert Evans had worked together on Rosemary’s Baby in 1968. That was when Evans was head of production at Paramount. By 1974, he was also an independent producer for Paramount, and he produced Chinatown in this capacity. He’d approached Towne to do an adaptation of The Great Gatsby, but Towne said he had an idea for a detective story he wanted to write. Offered $175,000 for the Gatsby script, Towne accepted $25,000 to write his own script, and came back 18 months later with a screenplay 180 pages long. Polanski came on board because he liked the script. He did order Towne to shorten it, however, and eliminated a voiceover Towne had included. As the film stands, everything Nicholson’s detective Jake Gittes sees and discovers the audience sees and discovers with him; it’s a first person film, with Gittes as the “I” of hardboiled fiction in the Philip Marlowe mode, except in Polanski’s expert hands the subjectivity is all rendered visually. We get no hearkening back to an earlier time through the creation of a 40’s sounding narrator, no sense at all, as one does often with period genre stuff, that the movie is a pastiche. Chinatown has an immediacy that’s rare in films of any genre, and this immediacy, along with its formal perfection, is one of the things that keeps the film from dating. Another striking aspect is how Polanski uses time. Chinatown is gripping from start to finish, but it moves at an unhurried pace. Whether Gittes is following a man thought to be cheating on his wife, waiting to be received at a large house, or visiting a hall of records, the film never rushes. We see Gittes walking, telling jokes, climbing fences, driving, sitting down on a stakeout to have a cigarette. The movie proceeds with a rhythm that feels like real life, not sped up film time, yet it never for a second feels slow or unfocused. We sink into Chinatown, pulled along by its plot and its accretion of details, and what began as an apparent divorce job for Gittes, something run of the mill, becomes a case that has vast dimensions. Chinatown blends personal violation with public violation in a way virtually no other film does, and because Polanski creates such a rich sense of reality, the darkness at the film's core has weight. Though the movie occupies a space in a particular tradition – noir, the hardboiled detective story, etc – you never feel that you’re watching a film about other films. You don’t sit there spotting references and allusions and in jokes. Chinatown is filled with cynical humor, most of it courtesy of Gittes, but it tells its complicated story straight, its characters idiosyncratic people. We get no types. Gittes is neither a moody, tarnished knight in the Marlowe mold nor a hard drinking private eye. Dunaway’s Evelyn Mulray initially seems like she’ll be a standard femme fatale but turns out to be something else entirely. John Huston’s Noah Cross has a certain courtliness but seeks to dominate both in the public and the personal sphere. Even the secondary characters and the throwaway ones are memorable. The complexity of the major players, the vividness of everyone onscreen, helps make the story unpredictable, and as the film’s climax approaches, you care completely about what will happen. Which brings me to the ending. It’s now well known that Towne wrote a different ending than the one eventually used and that Polanski had to argue with Towne and Evans to get the ending he wanted. Word is that Evans and Polanski stopped talking (temporarily) over this disagreement, but that Polanski went ahead anyway with getting the ending he preferred down on the page. He did this a few days before the finale was shot, convinced that his ending would give the film a gravitas it wouldn't have with a more conventional denouement. With a conventional denouement, he argued, the movie would be “just another thriller”. Well, Evans had hired Polanski specifically because the producer wanted a European vision of the United States. “Europeans see America differently,” was his thought. Do they? Maybe, yes maybe they do, and it’s safe to say that even though he expressed resistance to Polanski’s vision, Evans got what he was seeking. Polanski delivered on the darkness and the cynicism in spades. He also, along with Towne and the actors and the crew, delivered on the beauty. The result was a masterpiece and also, by the way, the greatest private eye film ever made.